As the holiday season nears, I have started thinking about all the things I’ve learned in the last few years with my family about creating a meaningful and stress free Christmas (for everybody!) when there are young children in the house. It can be a big adjustment that first Christmas with a baby when you’re expecting that things will go as smoothly as they have in the past, but realizing that maybe that’s not quite possible this year. 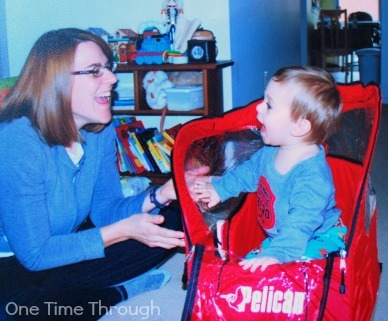 Time seems crunched and maybe past traditions are just not possible with a baby, toddler, or preschooler in tow. 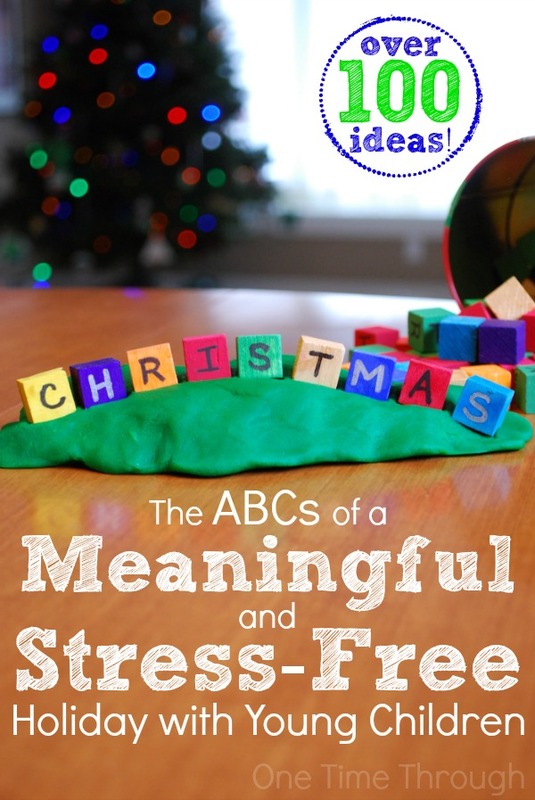 If you’ve visited One Time Through before, you know that we like our alphabetic series, and so I reflected and collected my best tips and ideas for keeping Christmas meaningful and special, while maintaining sanity when you have young children – and I put them into alphabetic order, just for fun! Have a Christmas Eve gift. Let the kids open one special gift that includes similar things every year like: a new pair of PJs, slippers, new mitts, and a Christmas book or movie. Buy or make a special ornament with your kids each year. It might be nice as the kids get older to have them choose one that reflects something special/memorable from their year. Make a special or funny Christmas breakfast or brunch. Check out these 8 amazing looking Christmas Breakfast ideas tested by Made From Pinterest, or make fun and simple Santa Pancakes. Take a PJ Christmas Light Night drive. Get the kiddos dressed and ready for bed, then take them on a special night drive to see the Christmas lights around town. Older kids can drink warm hot-chocolate with milk out of a sippy-cup on your tour! Invest in a few great Christmas CDs while your kids are young. The music of these albums will bring back warm memories in the future! Our current kid-friendly favourites are Johnny Reid’s Christmas and Raffi’s Christmas Album . Find 10 more easy and inexpensive ideas for traditions at True Aim. Christmas baking can still be done if you plan some fun activities for the kiddos to do, or find a way for them to be involved! 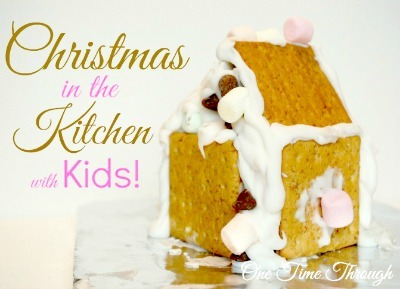 Check out our Christmas in the Kitchen with Kids roundup for tons of ideas to get kids baking or ideas to get kids playing independently while you bake! It’s all too easy to get so busy at this time of year, that the kids get a little bit forgotten. Just keeping in mind that the more connected they feel to you, the better their behaviour will be, often helps. Did you know that research shows that even just 10 minutes of pure connect time a day can make a huge difference! Check out our 30 Joyful Ways to Connect With Your Child in 10 Minutes post for ideas. Onetime and I have had fun connecting lately by doing kid-friendly meditations together from Cosmic Zen Den. Try the Whirly Burly Snow Storm video! The Military Wife and Mom has a huge list of Christmas-themed Games that you can play as a family including charades, bingo, a candy cane hunt, printable memory match games, trivia and more! As I said above, it’s not always possible to still have the same kind of Christmas that you used to have before kids. Reminding yourself that these early years are really going to fly, and that it will become easier as the kids get older, is helpful. I know lots of my friends said this to me when Onetime was young and now that he’s 3, I can’t believe how fast time has gone by and that we’ve already had 4 Christmases with him! So, for now, decide on what parts of celebrating are essential for you and your family – and DOABLE without adding extra stress on yourself and the kids. Eliminate everything else for this year. Maybe you don’t need to get a Christmas tree this year if junior is going to pull all the ornaments off. Get a mini table-top one for this year. Maybe that midnight Christmas Mass or evening party will just have to wait until the kiddos are old enough to tolerate an occasional late night without meltdown. We still feel like we can’t put out a very special antique German candle holder of my husband’s because the little choir people would likely be found in a toy car somewhere! Talk with your kids about your values at this time of year around GIVING, HELPING and SHARING with others. Talk about how important it is to spend time with FAMILY or how important certain traditions are to you. The more you talk, the more kids will start to understand from an early age what Christmas is really about for your family. Especially if you’re a working mom, or if you’ve got more than one child (heck, even if you’ve only got one like me! ), time can get crunched at this time of year. Keep your focus on what’s important and prioritize your time. You may need to say no to other commitments or extras that just aren’t possible this year. Don’t worry – there’ll be lots of time next year, or the year after that… for everything! I learned pretty early on, that Christmas shopping with a young child, could be traumatizing (for me – not him!). Try and arrange a time with your partner, a friend or family to look after the kids so you can get out and do the shopping by yourself. It’ll go so much more smoothly and quickly! It’s amazing what you can do in an hour without a child – isn’t it? If you DO have the time to shop with your kiddos, why not have them contribute some of their piggy bank earnings to help them understand the importance of truly giving? Side benefit: they may come to appreciate the gifts they receive a little more! Read more about teaching kids about money here, including how to save for gifts. Receiving a handmade gift or card is always so nice! It can be difficult to find time to still make this kind of thing with young children, but it can still be done, just keep it simple. Here’s a post from Red Ted Art with some great ideas for simple Christmas Cards kids can make – she even has video tutorials. 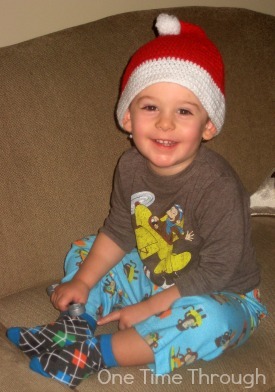 Or visit Happy Hooligans to find 40 Useful Gifts Kids Can Make. Check out All in All for a simple 4-ingredient recipe for Cinnamon Honey Butter that would make a nice, simple gift as well as suggestions for making up gift baskets. The Dating Divas has a ginormous roundup of DIY Gifts that are quick and easy to make that can be used for neighbours, friends, teachers, acquaintances, colleagues etc. Onetime really enjoyed exploring rubber stamps with me last year when we made gift tags together. If you have a big family that rotates the job of hosting Christmas dinner, like mine does, don’t be afraid to ask for HELP! Try suggesting a potluck for a few years, or maybe just scale things down and only have a Christmas brunch, or a restaurant dinner for a few years. 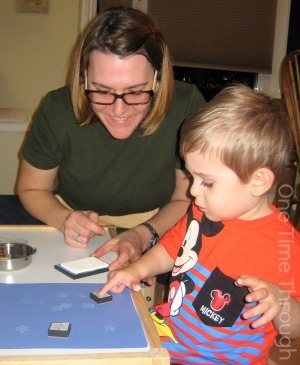 I love the idea of writing down and saving memories, but who has time to scrapbook when you have young children? Why not try creating a Joyful Jar instead this holiday? The idea is you pick out a nice glass jar and each time you do something fun for the holidays, pop a memento in the jar to remember it. For example, on that first visit to Santa, you could add a copy of the photo, or write a few lines on a piece of red paper about the experience. You can add photos, tickets, trinkets, receipts, and any other objects that might represent an event. Involve your kids by asking what they’d like to add to the jar to represent a special memory. You could even include this lovely Christmas Memories Book idea with a free reflections printable from The Madhouse. 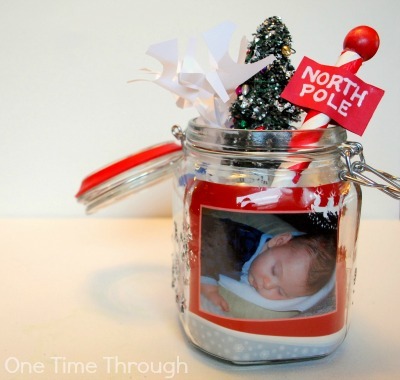 You can make a new jar each Christmas, or add to the same one every year. Up to you – just do it! The holidays can be especially tough on young children if you have decided to leave your home to visit others. Kids thrive on routine and when the kids are happy, everything will be less stressful. Try to keep some things the same when you’re away, like bedtime routines, outdoor time, and mealtimes. Christmas is supposed to be about love. If everything else goes out the window…don’t let it be this! With late nights, music, parties, lights and new people, the holidays can be stressful for very young or sensitive children. Kids may actually need MORE rest and quiet time than usual amidst all the hustle and bustle. Plan for earlier bedtimes, extra naps, and just general downtime to keep your kids happy and positive. Quiet playdough activities are perfect for de-stimulating kids – have you seen our fun and simple 12 Days of Christmas Playdough series? I use the the term “neighbours” in its broadest sense. Christmas is definitely a time to be thankful for what we have and to try to help out others who may not be as well off. Going to a soup kitchen and volunteering time is not usually realistic when you have a little one or ones, but if you have a little time, you could put together a shoe box gift for a local shelter, donate to a toy drive, or just donate your child’s outgrown toys and clothes to a charity. Even less time? Let your child see you buying a brown bag of food for the less fortunate at the grocery store. Even less time or money’s tight? Give your child some change and have them make a gift to the local Salvation Army collector at the mall. Maybe even just look at your neighbourhood – are there any people that might appreciate a lift to the store to shop, a tin of cookies, or just a handmade ornament from your child? Teach Mama has a terrific roundup of ideas for Gifts that Give Back including links to charities. Before kids, I spent countless hours crafting homemade Christmas cards and ornaments for family and friends. After my son was born, I realized that that was a luxury that I didn’t have and so instead, began to focus on making ornaments with my son. When Onetime was 1, we did the classic Santa Salt Dough Handprint ornament which was a favourite with friends and family. At age 2, we got a little messy and turned Onetime’s handprints into an adorable Snowman Christmas Ball. This year Onetime was practically able to make a SIMPLE and pretty Pine Sprig Ball ornament by himself! I also decided to start keeping track of these special ornaments by taking (and actually printing!) a photograph of them and recording a little blurb about how they were made, or why they were special and the date. We are going to keep this book with our ornaments so that we can reflect back each year as we decorate our tree! To read more about this Christmas Ornament Memory Book and to get the free printable scrapbooking cards – click HERE. It’s easy to go crazy and videotape or photograph every moment of your child’s first few Christmases (guilty! ), but really – are you ever going to sit down again and watch hours of ho-hum footage later? Probably not. And more importantly – aren’t you missing really BEING PRESENT with your kids when you’re busy taking pictures and video? Why not instead focus on capturing those first few moments that are really memorable. 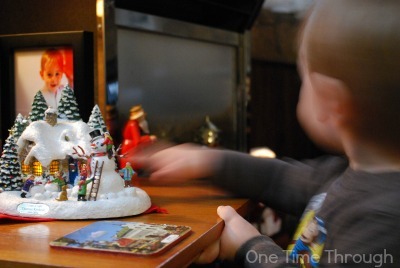 I love the idea from Click It Up a Notch to get a photograph (or video) of your child’s first sight of the tree or stockings on Christmas morning. Couldn’t find the digital version of this photo, so this is a photo of a photo, but catching that first reaction to the sled gift was priceless! Get ahead of them before they come down and make sure as many lights are on as possible and open all curtains to let natural light in, so the photos turn out well. Try not to use a flash if possible (flattens features out). One of my favourite Christmas pics of Onetime – although the photo isn’t very clear, it captures his happy spirit! Family shots can be done on Christmas Eve, or even Boxing Day – when the stress is off a bit. Or – if you’re really on top of things, do them a few weeks before Christmas so you can include photos in your gifts to family and friends and don’t need to worry about it while you’re also trying to get Christmas dinner ready and entertaining. To Santa or not to Santa…just something to think about… There are some great debates on both sides. To find links to them, check out our Everything Santa Claus post. You might also find this video from The Behavioural Science Guys about how the typical Santa visit encourages self-centered thinking very interesting…I certainly did! I’m really not very good at this one – despite having good incentive to do so with being on on one income right now with a mortgage to pay! However, research has shown that financial stress is one of the biggest stressors at this time of year. Plan ahead for gifts. Make your list and shop only for those items so you don’t get caught up buying other things you see that might be more expensive. Buy gifts throughout the year when you see them on sale, so that expenses don’t all pile up at Christmas time. Create a Christmas budget where you put aside a few dollars a week into a jar just for gifts. Discuss a budget-friendly spending limit for gifts with family and friends so everyone’s on the same page. 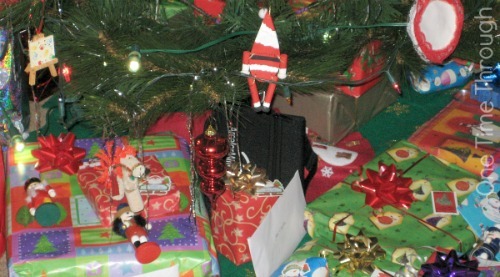 Instead of exchanging gifts with friends and family (or your partner), organize an “experience” swap. Make coupons for each other for things you could do for each other or for experiences you could do together that might not cost too much. Consider giving “family gifts” to siblings and nieces/nephews instead of individual gifts. Include a board game or movies with some treats to share. Send online Christmas cards instead of paper cards. Have a hand-made gifts exchange – where you cook/bake or craft something simple for friends/family in lieu of store-bought gifts. Read them quality kids Christmas books that teach about the meaning of the season, as well as get them excited. My favourites for kids ages 1 to 6 are: The Jolly Christmas Postman (find our review and a fun activity for this book here), Stick Man (read our Stickman review and ornament here), The Night Before Christmas (illustrated in plasticine by Barbara Reid) , and The Littlest Angel (read our review of this book here). In all the hustle and bustle, with images of Santa and Frosty everywhere, it’s easy to forget the real reason why we have Christmas – especially if your family are not church-goers. Take time to talk to your child about the Christ part of Christmas. A great way to introduce the true meaning of Christmas is through a play activity like our Holy Night Playdough. Need more ideas? Check out these Nativity Craft and Activity Ideas from Super Mommy Club, or these Christ-Centered Activities from Meaningful Mama. Unfortunately sometimes on Christmas Day when things get busy and we’re in the middle of kitchen chaos (or is that just me? ), the kids get either underfoot or forgotten. Why not plan to have a few simple activities available for the kids during dinner prep time? Playdough is an easy one that appeals to kids of all ages – you can get the older nieces and nephews/sisters and brothers to supervise the younger ones. Be sure to make a few batches so there will be enough to go around! Or, if you’re lucky enough to have Magna-Tiles® Clear Colors 100 Piece Set like we do, try adding some jingle bells into the mix like they did over at And Next Comes L.
Even a Christmas movie can be a nice way for the kids to chill out for a bit while the adults are occupied. Our personal favourites are the The Muppet Christmas Carol and The Original Christmas Classics Gift Set with Frosty The Snowman; Frosty Returns; Rudolph the Red-Nosed Reindeer; Santa Claus Is Comin’ To Town; The Little Drummer Boy; Cricket On The Hearth; and Mr Magoo’s Christmas Carol. These classics never grow old! Of all my Christmas memories, it’s always the special visits that I remember the most fondly. The trips to Midnight Mass with my Dad (even though we weren’t Catholic! ), visiting the Christmas lights at Niagara Falls with my sister and her kids, and the yearly ventures to relatives’ homes for the extended family Christmas dinners. Visits are fun for some young kids too, but can throw others off. New people, unfamiliar locations, expectations for hugs and kisses from people they see once a year…you know what I’m talking about, right? To decrease your child’s stress, try talking to them ahead of time about what is likely to happen during the visit. You can also prepare them for situations that you know are likely to cause anxiety by discussing ways to cope ahead of time. Find even more strategies for Tough Holiday Situations at Dirt and Boogers. To avoid awkward situations like your child not saying “Thank You” for a gift, prep them ahead of time with a pep talk and be sure to read our 5 Keys to Raising Grateful Kids post if you get a chance. Just a reminder to take time out to slow down a bit this season and wonder along with your child. It’s one of the nicest things about having kids – we can see things through their eyes as if we were children again. 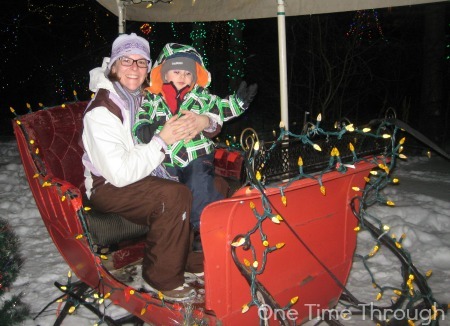 I had just as much fun as Onetime when we visited this beautiful lit-up Christmas park last year! Keep them realistic – meaning expect imperfection. If you’re like me and you’re already forgetting what happened at last year’s Christmas, and definitely at the one before that…and before that – find a way to record the memories now for future yule reflections. You can try our Joyful Jar, or a yearly Christmas Ornament Memory Book or even have a large scrapbook page that all the family can sign with special Christmas messages or memories (we do this at birthdays!). Get them out each year and reflect on them together – trust me, this will be a favourite tradition. Once it’s all over, you’ll get to sleep again instead of staying up wrapping presents all night and prepping your special stuffing that you promised to bring to Grandma’s. But seriously – do remember to try to get good sleep during the holidays too for yourself and your kids’ sanity. Try not to stray too far from your kids’ nap and bed routines, or you may find you have a very cranky, stress-filled child who doesn’t want to dress nicely, or pose for the family photo, or give Grandpa a hug. And how much fun is that for everyone? 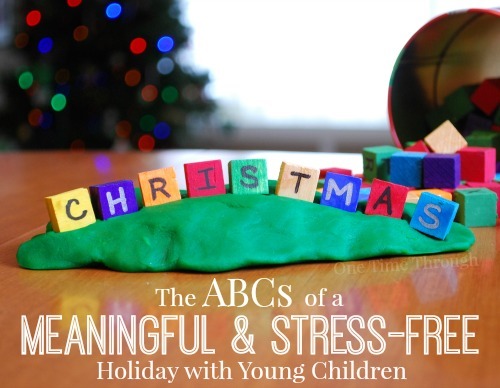 That’s it for our ABCs of a Meaningful and Stress Free Christmas with Young Children! If you’re looking for other Christmas kids’ crafts and activities, be sure to follow our Pinterest board: Follow One Time Through’s board Christmas on Pinterest. To a wonderful and stress free Christmas holiday!